Blackberry Chairman Balsillie Steps Down | BlackBerry Blast! 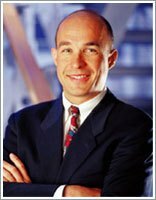 Research in Motion co-CEO Jim Balsillie is resigning as chairman of the company. his resignation comes just after the company reported over $250 million in stock option accounting errors. The company says Mr. Balsillie had voluntarily stepped down as chairman and that his resignation is "consistent with current best practices in corporate governance, the roles of chairman and CEO are being separated." Mr. Balsillie will stay on as director and as co-chief executive with Michael Laziridis.